One of the largest aquariums of South Korea, Sea Life Busan Aquarium is the much ‘talked about’ tourist attraction of Busan. Right from 3 years old child to grown up individuals, people belonging to different age group do come to visit this aquarium from all over the world. The aquarium will take you into an awe-inspiring journey into the world that lies far below the sea. It is being divided into 3 levels. A resting place, an outdoor park and a parking space is on the ground floor. A theme restaurant, resting room and a souvenir shop is on the first underground level and the aquarium is on the levels B2 and B3. Here, you get to see around 250 marine species and around 10,000 aquatic animals like jackass penguins, clawed otters, electric eels, sharks, piranhas, giant turtles, colorful jellies and fishes. Visiting this aquarium will give you both an engaging and educational experience. 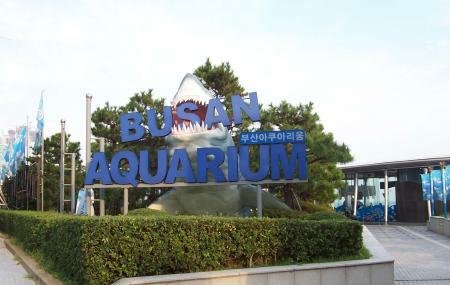 This is why visiting Sea Life Aquarium is one of the best things to do in Busan, and how to get to Busan Aquarium should be the first question when you land in Busan. Also, visit the popular attractions in the city by following Busan itinerary 1 day. Bring the birth certificate of your child for free admission. Get your parking tickets stamped either at Busan Aquarium ticket box or the souvenir shop. Parking fee might vary during summer peak season. Shark Diving is applicable only for adults over 16years. Glass bottom boat ride, Shark Dive, 3D Rider, Audio Guide are there. Self guided learning programs are available for kids from 3years – 11 years. Discount rate is applicable for 1 accompanying the handicapped. Children under 35 months get free admission if the guardian pays full ticket price for adult tickets. If you buy 3D Ride ticket from within the Aquarium, the price will be 5,000 won. Shark Diving Fees – Shark diving fees + Aquarium admission fee + certification photos 150,000 won (including tax). Parking Fees- 1 hour free parking. After that, 1,000 won for each additional 30 minutes. Designated parking - 1 hour 30mins free parking. After that, 1,000 won for additional 30 minutes. Check official website for changes in price and further details before visiting. Love this? Explore the entire list of places to visit in Busan before you plan your trip. Fancy a good night's sleep after a tiring day? Check out where to stay in Busan and book an accommodation of your choice. How popular is Sea Life Busan Aquarium? People normally club together Songjeong Beach and Dongbaek Island while planning their visit to Sea Life Busan Aquarium. Very cool aquarium, very clean amenities. Very friendly staff. We bought a family pass package where it includes a glass bottom boat ride (which was a little disappointing due to the small area it travels), a free group photo and a kid's mission pack (which contains information of the sea lives, etc). There's an underwater show & cool fashion decore theme display going on at the moment. We totally enjoyed it. Very pleasant place to visit. They sell some extra special things such as a boat ride with glass floor. Remember to bring extra money if you like to have some extra fun. For kids they have a mermaid show. For adults they have feeding time and some shark performances. Amazing aquarium experience! Beautiful scenery, cute mermaid show. Great for kids. I have visited most of the aquariums in Korea and I feel like this was by far the best, the prettiest and most original. They had different types of rooms, experiences and variety of things to offer. Definitely recommend! Small aquarium. Suitable to bring children. Otter feeding, penguin feeding, shark feeding and more. Comfortable toilet and nursing room for mothers.